Creativity, Innovation, & Entrepreneurship: Famous Inventor Brothers...who are they? Famous Inventor Brothers...who are they? Okay, let's see...there's the Wright Brothers (airplane), the Duryea Brothers (gasoline car), and the Jacuzzi Brothers (whirlpool spas). But, have you heard of the Tomasetti Brothers? They're the innovators of the ShaveMate, an all-in-one razor that combines a 6-bladed razor with shaving cream. I highlight these brothers' "invention" not because of the novelty of the concept, nor the boldness with which they are trying to conquer a very well-protected market space. Instead, I choose to highlight them for how they use one of the SIDEs of Innovation to bring a new product to the marketplace. If you were a student in my Creativity, Innovation, and Entrepreneurship class, you'd remember the SIDEs of Innovation as: synthesis, invention, duplication, and extension. Students--and many would-be entrepreneurs--get hung up on the "I'm not an inventor, so therefore I can't create a new product" mind block. I try to coax them out of this by reminding them that innovation need not always come from invention, but instead can come from synthesizing, duplicating, or extending ideas. The Tomasetti brothers--Lou and Pete--have done just that by integrating real lanolin-enriched shaving cream inside the handle of a disposable razor. And, they've managed to do it in a fantastically interesting way. While you're not likely to see Super Bowl ads for the product anytime soon, you may come across a fan of the product who uses the ShaveMate Diva or Titan while traveling. The ShaveMate is perfectly suited for that application. However, it need not remain stowed in your travel case. It works well as a daily replacement to the offerings found on the personal grooming aisle at your local grocery store or big box retailer. The design of the packaging is very well done and looks like something you'd see from Gillette, a Procter & Gamble brand. As you may know, Gillette and their mach3, Fusion, and Venus lines occupy 70% of the manual blades and razors market. I guess it's fair to refer to Gillette as the ShaveMate's big, hairy gorilla of a competitor. Yes, pun intended. I applaud these brothers for their tenacity and willingness to challenge the status quo. Go, brothers, go! Thought it was very clever how the brothers decided to utilize the excess space in the handle of the razor, as a compartment/dispenser for shaving cream. Six blades sound a little scary to me, but nonetheless a great innovative product. Thanks for sharing this information. I find this article especially interesting because I actually use Titan razors and I like them very much. Combining of the shaving cream inside the razor is definitely innovative because it makes shaving so much easier and quicker. 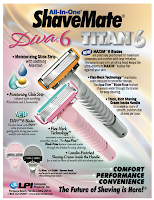 Naturally I had assumed a large company came up with Shavemate Titan and Diva (the female companion razor model). Now that I know two brothers (I believe they are American brothers?) make these incredible razors, I am even more happy to be a satisfied customer. Regarding performance; no need to be scared of the six blades, the head is slim and the shave is quite premium, very smooth and close. I find that these shave even smoother than the five blades razors out there. Yes, I agree, Go brothers Go!